There is this particular saying that goes like this, where the nose goes, the dog follows. I suppose that might also be true of us humans if we had the £49.99 Aroma R-evolution as part of our dining experience. After all, there is nothing quite like a lip smackingly delicious meal that lets us enjoy the chef’s effort, but the Aroma R-evolution will surely spice things up by a few notches. Touted to be an intense and unique sensory tasting experience, it will be able to alter the way that you perceive flavors for good. 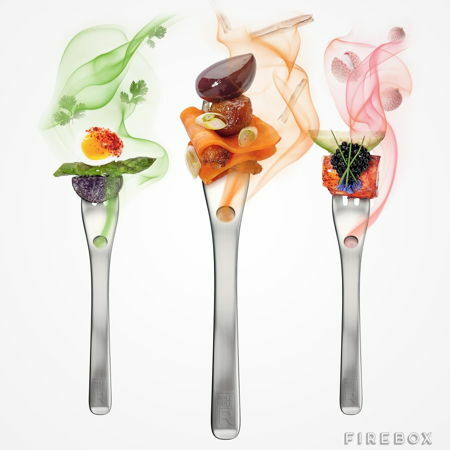 With the Aroma R-evolution, you need not have to rely on MSG alone to make your dishes taste exceptionally delicious, as it is able to enhance dishes while tricking your mind with the unusual aroma pairings. Each purchase will arrive with a quartet of aroma forks, delivering fragrant fun for the entire family. In its entirety, there are 21 different aromas to mix and match. While our tongues are able to recognize 5 primary tastes, our noses are a whole lot more sensitive, being able to tell the difference between the numerous subtle food flavors. Each time you eat with this innovative utensil, you will enjoy a flow of potent vapors which doubles the flavors for your brain to analyze. Taste it to believe it! Definitely far more sophisticated than forks like the Spinning Spaghetti Fork!